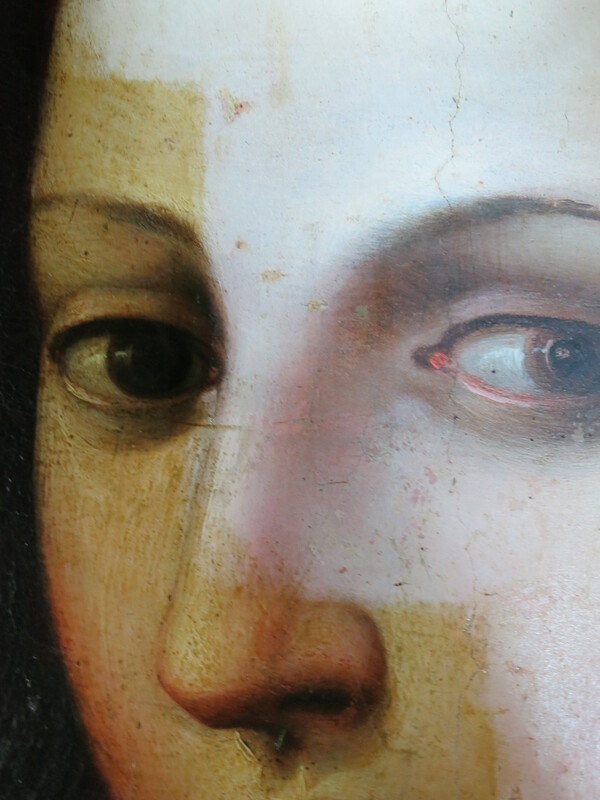 After several months of conservation work on The Mystic Marriage of Saint Catherine of Alexandria with Saint Apollonia is now completed and looking better than ever. The painting has gone through various stages of cleaning, consolidating, conserving, careful moving and wrapping to now be seen in it’s original glory. Throughout this project visitors to the Palace have been able to see conservation work in action in the Chapel Royal and ask questions which had visitors coming back again and again to see how the work was progressing. The painting was first seen hung in it’s original place at the end of the Tapestry Gallery at our Christmas Weekend, surrounded by Christmas trees which was truly magical. Wendy, Geri, Aisha and the rest of the team at Falkland Palace and Gardens would like to say a big thank you to everyone who made this project possible; Henry Matthews, Gail Egan, Julie Bon, Alistair Smith, Jane Batty, T&S and the volunteers at the Palace. 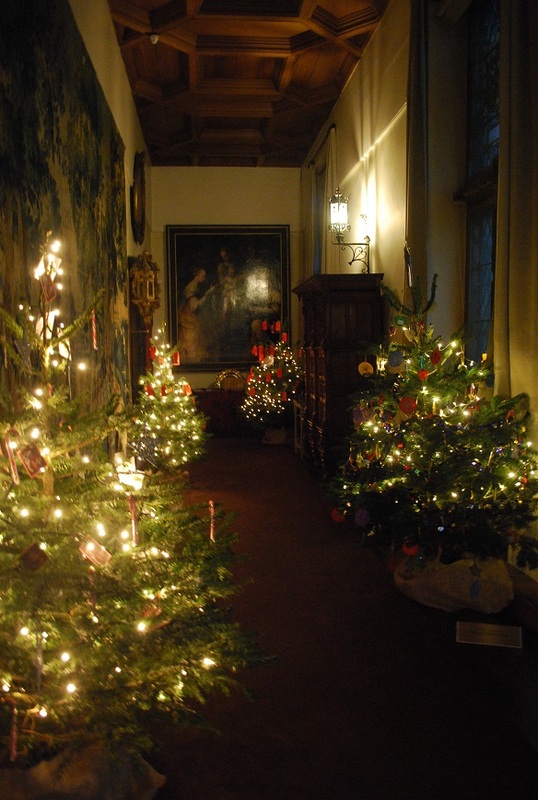 This entry was posted in Falkland Palace, Painting Conservation and tagged conservation project, falkland palace, National Trust for Scotland, painting conservation, painting conservation project, painting conservation project falkla on December 18, 2014 by falklandpalacegarden. 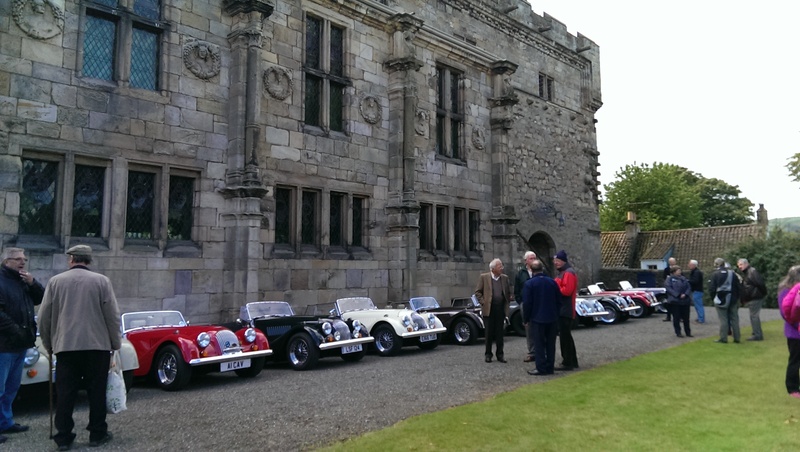 Today 24 classic Morgan cars from the Morgan Sports Car Club parked up at Falkland Palace to celebrate the club’s 10th anniversary. These magnificent cars in this ancient setting was very evocative and a welcome addition to the visitors experience, as well as giving the staff an excuse to get out the office and visit the lovely gardens! 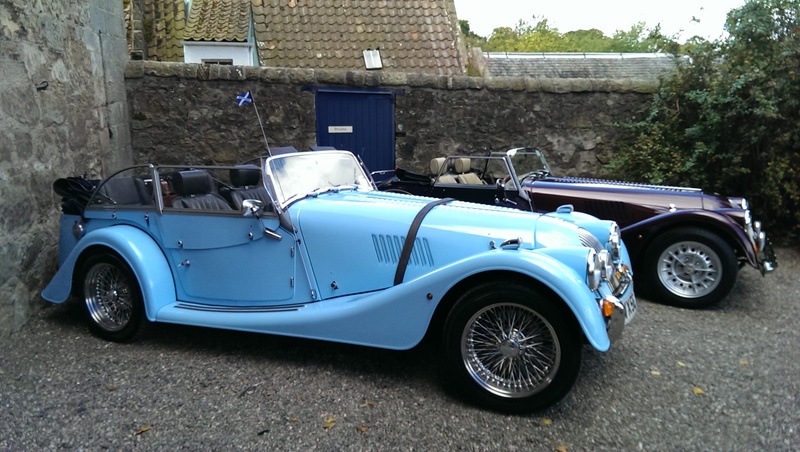 After much debating no one could decide which was their favourite, they were all stunning though this blue beauty caught the attention of our Learning Officer, who said it was ‘pure braw’. 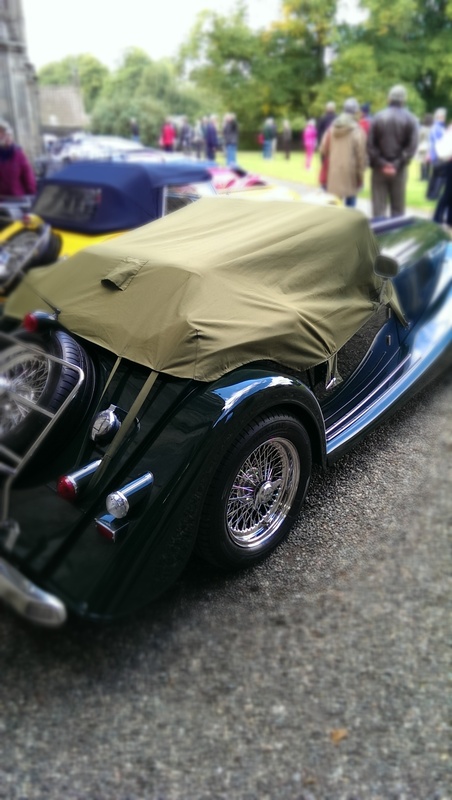 This entry was posted in Gardens and tagged classic cars, falkland palace and gardens, morgan sports car club, National Trust for Scotland on August 26, 2014 by falklandpalacegarden. Diana Gabaldon’s series, Outlander has been taken on by Starz to create a TV series that has everyone holding their breath. The story which traces Claire Beachum’s journey as she travels back in time from the 1940s to 1700s after touching a stone in a stone circle in Inverness. 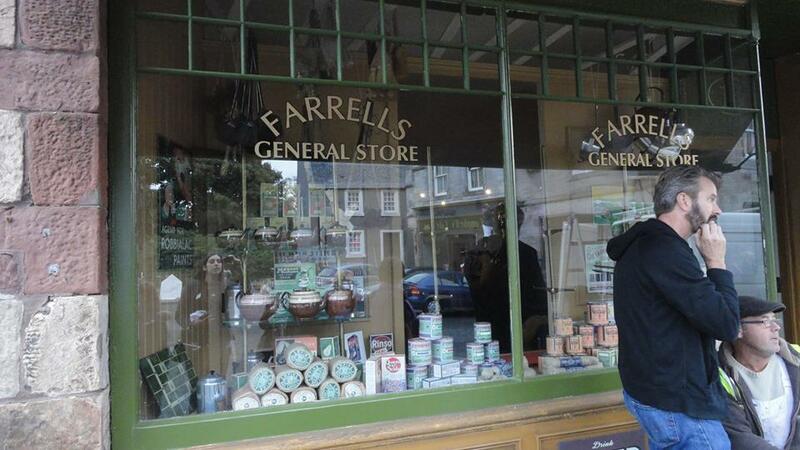 Starz transformed the village of Falkland and took it back in time by painting shop fronts, moving street furniture and even setting up wind and rain machines (real rain doesn’t show up in films, believe us, it was raining!). 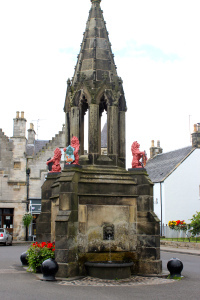 The village of Falkland waits patiently for the release of Outlander in Scotland. We leave you with a photograph of Falkland Village in 1940. If you have visited the village you will probably agree with the Starz team, it hasn’t changed much in all those years. 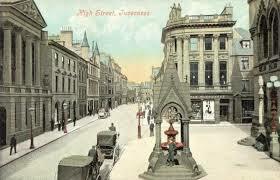 It is a true time capsule and a place that will now link with the magic of Outlander forever. 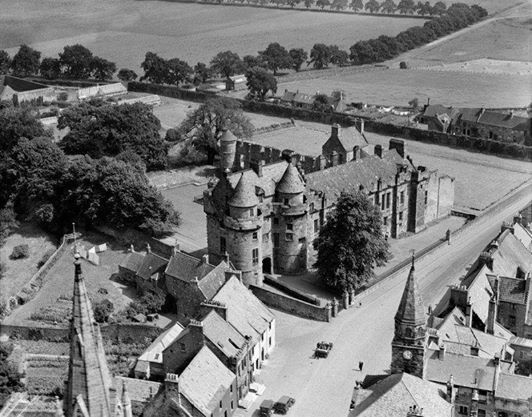 This entry was posted in Falkland Palace and tagged Diana Gabaldon, falkland palace and gardens, National Trust for Scotland, Outlander, Starz on August 25, 2014 by falklandpalacegarden. Conservators Gail and Henry have been working hard to remove 500 years of layered varnishes and over paint to The Mystic Marriage. This rare Brini painting (1570) has been on show to the public for nearly two weeks in the Chapel Royal, as it has been undergoing some much needed conservation work. Visitors, staff and the local media have greatly enjoyed watching the painting come to life through this unusual conservation project. 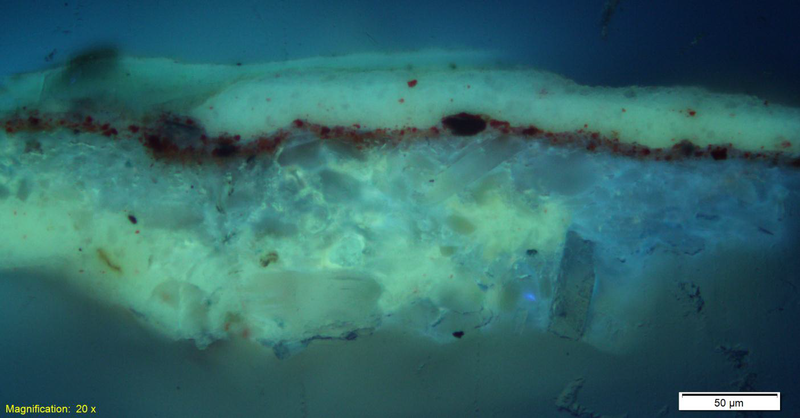 Painstaking cleaning using cotton buds and organic solvents has revealed the exquisite original colours and paintwork, as well as highlighting the plaster repair work that has been carried out over the last half century, to fill in cracks in the wood. Now that the painting has been cleaned the next phase of treatment will be structural repair work to the wooden panel. This will involve lying the painting horizontally on it’s specially designed support boards and also tackling the wood worm problem. 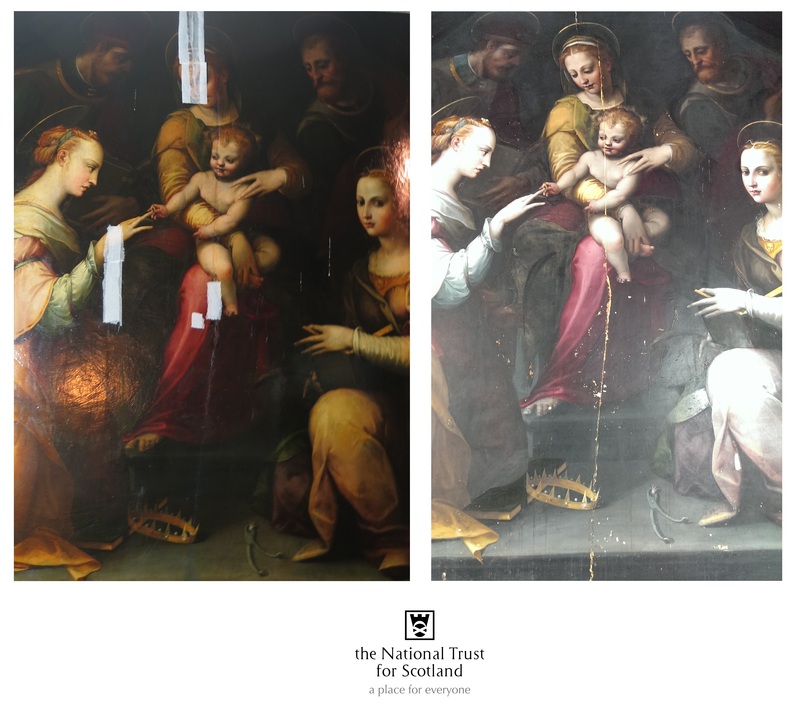 This beautiful painting is finally getting the TLC it desperately needs and we are thrilled to be able to share this conservation project directly with the public, which is a first for the NTS. To see the next stages of this fascinating project, keep checking back to this blog or visit our facebook http://on.fb.me/171AsJC and twitter http://bit.ly/1vkZmiO pages. This entry was posted in Painting Conservation and tagged falkland palace and gardens, National Trust for Scotland, painting conservation project on August 8, 2014 by falklandpalacegarden. 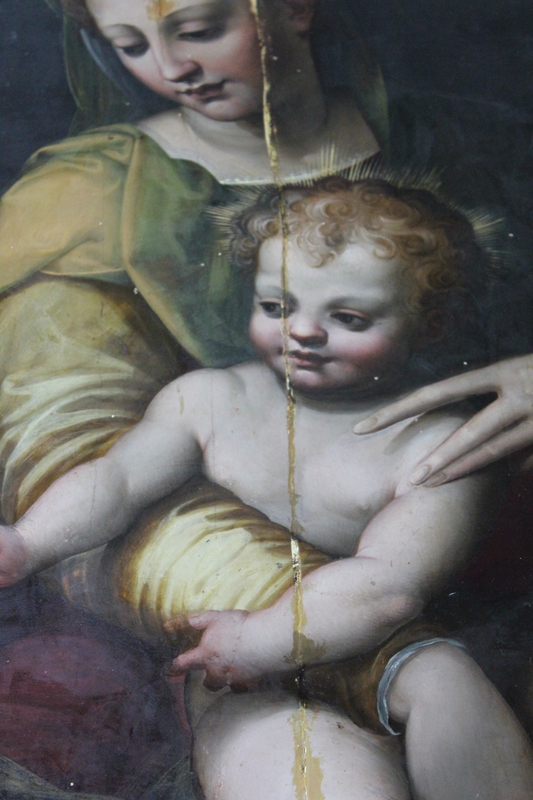 Over the last three days specialist conservators Gail and Henry have been carefully removing layers of discoloured varnish and dirt to reveal the true colours of the painting. Both Henry and Gail believe that understanding the composition of the painting structure will greatly help them in deciding the most appropriate treatment to be carried out on the picture. What was thought to be pale green turns out to be beautiful powder blue. What was once a dirty orange is bright gold. Extra detail lost under the centuries of varnish is being revealed, in amazing colour such as the tiny face on the front of ST Appolonia’s dress and the delicate veil on her hair. 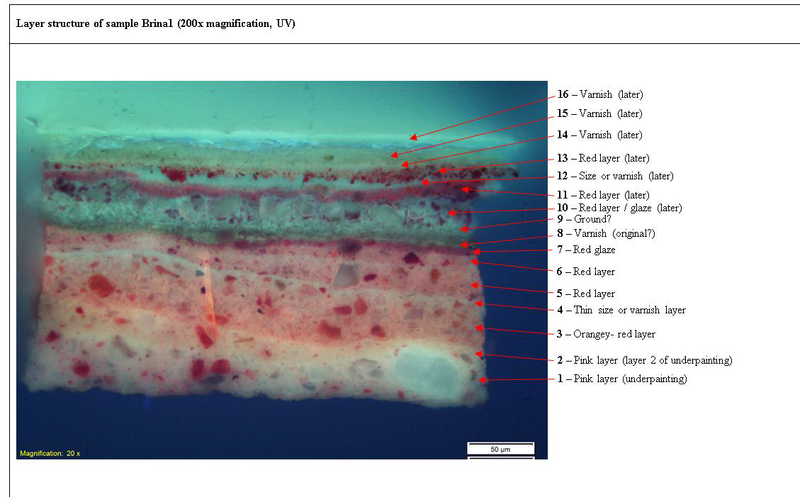 Technical analysis of the paint layers by Glasgow University Department of Technical Art History has identified pigments commonly used in the 15th and 16th centuries, as we had hoped to find. Potential for further investigation into the paints used and the wood on which the subject is painted. Come and see Gail and Henry at work in the Chapel Royal at 4pm on the 4th of August. Photos and interviews will be available with conservators Gail and Henry, Wendy Purvis, Falkland Palace Property Manager and Julie Bon, Trust Conservator and project manager. 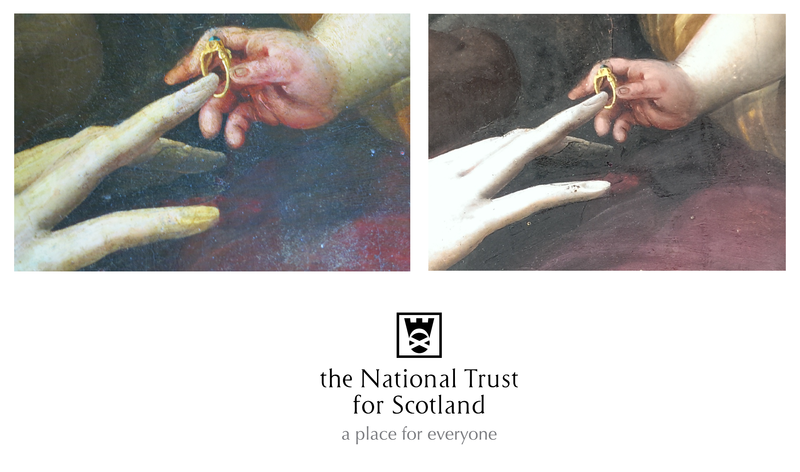 This entry was posted in Painting Conservation and tagged falkland palace, National Trust for Scotland, painting conservation project on August 1, 2014 by falklandpalacegarden.